The Program collaborated in the publication of the 2006 Latin American Business Environment Report (LABER). The annual report presents an appraisal of the economic, social, and political events that have shaped the business and investment climate in Latin America as a region and in its 20 most important economies. This edition, cited in the November 2006 Florida Trend cover story, notes critical features of the legal system that affect the conduct of economic activity in the region. The Program coordinates the activities of these centers as they relate to law, policy and relations in the Americas. The Program carries out a research agenda on topics related to the rule of law and justice reform throughout the Americas and provides technical support and analysis in regional judicial reform efforts. The Law and Policy in the Americas Program is currently organizing the 9th Annual Conference on Legal & Policy Issues in the Americas, to be held in the Brazilian cities of Rio de Janeiro and Curitiba from the 26th to the 30th of May, 2008. The 2008 Conference in Brazil will unite scholars and political leaders from throughout the Americas to discuss the rule of law, trade and human rights in the region, with a particular focus on the comparative legal systems of Brazil and Spanish-speaking Latin America. 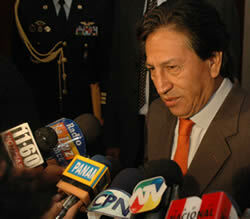 President Alejandro Toledo at the 7th Annual Conference on Legal & Policy Issues in the Americas. Lima, Peru. The Program sponsors interdisciplinary lectures and graduate seminars on Program related issues and themes and sponsors presentations on these topics on the campus of the University of Florida and throughout the Americas. The Law & Policy in the Americas Seminar, LAW 6936, is an interdisciplinary, cross-listed course taught at the law school but offering credit to both law students and graduate students from the Center for Latin American Studies. The course evaluates the development of legal systems in the Americas including a comparative analysis. Topics include constitutional comparisons, trade and commercial development, alternative dispute resolution mechanism use and development, citizen security and human rights, property rights, and a review of regional judicial reform efforts focusing on efforts to improve access, efficiency and transparency in justice systems as a means to promote accountability and combat corruption. Readings are both theoretical and applied and focus on topics such as differing legal cultures, distinguishing features of the civil and common law systems, the informal economy and access to property rights, and utilize current periodicals to follow regional political developments and trade agreement negotiations. The Spring 2007 course received an Internationalizing the Curriculum Grant Award. A Program objective of increased student and faculty exchange is achieved through the offering of a guest lecturer series [8kb PDF], and the offering of law student exchanges [30kb PDF] in Chile, Costa Rica, and Peru in the areas of human rights, property rights, and judicial reform. 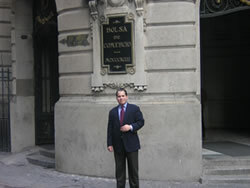 University of Florida law student extern Jesus Suarez outside of the Stock Exchange in Santiago, Chile. This course provides students with practical exposure to Latin American legal systems, using Chile and the country’s judicial reform process as a case study. The course includes human rights and trade components. In-country visits consist of both site tours and presentations on relevant topics. The study tour enables students to better understand and manage international human rights and trade matters. The M.A. Latin American Studies (MALAS) / JD joint degree program provides an opportunity for students to develop their area and topical expertise in Latin America in combination with the study of law. Candidates for the joint program must meet entrance requirements for and be admitted to both academic units. Due to reduced credit requirements, students can earn both degrees in approximately one year less than if both degrees were earned separately. MALAS/JD students fulfill the same degree requirements as regular MALAS students, but use 12 Law credit hours toward the 33 credit hours of classes for the MALAS program. The UF Levin College of Law accepts 12 MALAS credits as well. Overall, up to 24 credits may count towards the joint degree. The thesis topic of MALAS/JD students should be on a topic relating to law and Latin America. Please visit http://www.latam.ufl.edu/funding/centersfa.html for funding opportunities available, including Foreign Language and Area Studies (FLAS) Fellowships. For additional information, please contact Timothy McLendon at mclendon@law.ufl.edu or Joan Flocks at flocks@law.ufl.edu, phone number (352) 273-0835.